Klik på billedet og se alle billeder fra Hotel Tivoli. Restaurant, Døgnåben reception, Sightseeingskranke, Bagageopbevaring, Concierge, Fælles opholdsrum/TV-område, Elevator, Varme, Rygning forbudt på alle fælles- og privatområder. 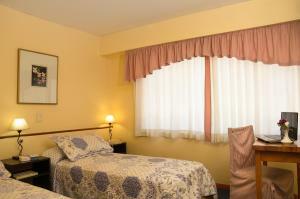 Only 300 metres from Bariloche’s civic centre, Hotel Tivoli offers heated rooms with a cable TV. Free Wi-Fi is available in common areas. Nahuel Huapi Lake is 150 metres away. Featuring large windows, rooms at Tivoli Hotel are bright. They feature a work desk, heating and private bathroom facilities. Linen is provided. Guests staying here can enjoy an on site restaurant and a shared lounge. A continental breakfast is served daily. Hotel Tivoli is 19 km from Luis Candelaria Airport. Please note that a local Ecotax, per person, per day, is not included on the fee. It applies to all guests older than 14 years old, and can only amount to the charge of a 3-night stay. Please note that guests arriving after 18:00 hs. should inform the property prior to their arrival. Upon check-in all guests should present their booking in a printed or digital version.